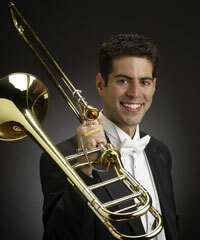 Cited by the New York Times as “a gifted young trombonist”, Shachar Israel currently serves as Assistant Principal Trombone of the Cleveland Orchestra. Born in Nahariya, Israel, he received his Bachelors of Music from The Curtis Institute of Music in Philadelphia, where he studied with Nitzan Haroz, Principal Trombonist of the Philadelphia Orchestra. His primary teachers include Joseph Alessi, Mark Lawrence, Mitchell Ross, Micha Davis and Joseph Nashkes. Prior to joining the Cleveland Orchestra, Mr. Israel was Principal Trombone of the Hartford (CT) and the Haddonfield (NJ) Symphonies. He has also performed with the Philadelphia Orchestra, the Boston Symphony, the New York Philharmonic, the Montreal Symphony and the Detroit Symphony. He has been a member of the Verbier Festival Orchestra, the Spoleto Festival Orchestra and attended 2 summers at the Music Academy of the West. A soloist and chamber musician, Shachar Israel performed Berio’s ‘Sequenza V’ for solo trombone at New York’s Lincoln Center for the New York Philharmonic’s “Day of Berio”. Mr. Israel has performed with Canadian Brass and recorded 4 albums with the group. He has been a soloist with the US Army Orchestra “Pershing’s Own”, Jupiter Symphony Players, the Cleveland Winds, and Cleveland State University’s Wind Ensemble. The trombonist was the winner of the Lewis Van Haney Philharmonic Prize Competition at the 2008 International Trombone Festival. Mr. Israel is also a founding member of the Great Lakes Trombone Ensemble. In addition to a busy performance schedule, Mr. Israel is on the faculty of Cleveland State University. He is the founder and Director of the Cleveland Trombone Seminar (CTS), held annually since 2012. CTS brings together motivated students and world-class professional musicians from around the world for 9 days of learning and great performances. Mr. Israel started his musical journey at the Kiryat-Yam Wind Band and he is a graduate of the Thelma Yellin High School in Givatyim, Israel. His studies while in Israel were made possible by the generosity of the America-Israel Cultural Foundation through its scholarship program, the Keren Sharet Competitions. Invest in the cultural health of a place that you love Become a Music Maker! If you believe in helping people in your community live vibrant, culturally healthy lifestyles, then join us as a Sponsor! © 2019 North Shore Chamber Music Festival.